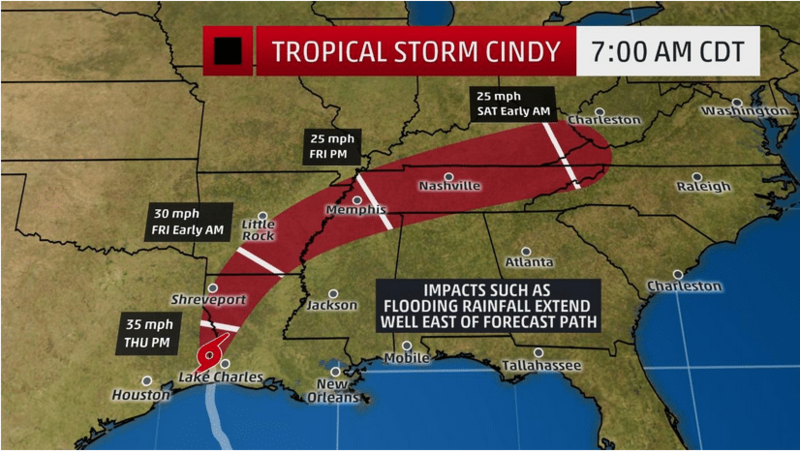 [NASHVILLE] – Electric cooperatives across Tennessee today prepare for the arrival of Tropical Storm Cindy which is anticipated to bring wind and significant rainfall to the Volunteer State overnight Thursday through Friday. The tropical storm, which made landfall at 4 a.m. today on the coast of Louisiana, is forecast to bring 25 mph winds and up to 6 inches of rain to Tennessee as it moves across the Southeast. Co-ops routinely provide assistance to one another during major outages. The Tennessee Electric Cooperative Association coordinates requests for assistance among Tennessee co-ops. “Our cooperatives are always quick to help those in need, whether it be a co-op in the next county or in another state,” says David Callis, executive vice president and general manager of the Tennessee Electric Cooperative Association.